There will be none of this during the 2011 season. ANN ARBOR, Mich. – University of Michigan football head coach Brady Hoke announced Sunday (Aug. 7) that senior wide receiver Darryl Stonum (Stafford, Texas/Dulles HS) will redshirt the 2011 season. Hoke also announced the suspension of sophomore punter Will Hagerup (Milwaukee, Wis./Whitefish Bay HS) for the first four games of the season and junior wide receiver Terrence Robinson (Klein, Texas/Oak HS) for the season opener for violating team rules. Michigan begins preparation for its 132nd season of gridiron action on Monday, Aug. 8. 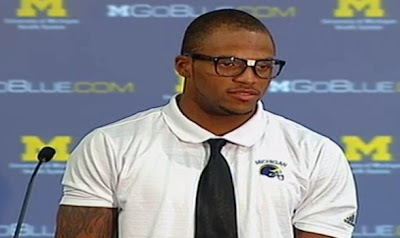 U-M opens the 2011 season on Sept. 3 at Michigan Stadium by hosting Western Michigan at 3:30 p.m. EDT on ABC. We know the Stonum decision stems from a DUI received during the off-season (his 2nd in 2 years). It was widely suspected that some sort of disciplinary action would be called for. While a forced redshirt is pretty harsh, it's probably the best Stonum could have hoped for. From what I hear, he was very close to not being on the fall roster. BUT...this opens the door for Stonum to make a splash in 2012. We're going to lose Odoms and Hemingway after this year. And if it weren't for this disciplinary action, Stonum too. Bonus...I guess. The suspensions of punter Will Hagerup and WR Terrence Robinson are for violations of team rules. If you recall, Hagerup was suspended for the OSU game last year. And correct me if I'm wrong, but he was also out for the bowl game as well? Either way he's a terrific punter and I hope he can pull it together. TRob's suspension will have minimal effect as he has yet to prove himself on the field...and it's only for the Western Michigan game.